Verum Option is a brokerage company that offers binary options trading since its foundation in 2015. It always provides only the best conditions. Broker is focused on every market participant, whether trader-novice or serious player of the binary options market. This broker keeps up with the time and quickly gains its popularity both in the postsoviet countries and the whole world. After all, keeping as the basis of western technologies of the brokers, which have been already proven, Verum Option has simply added its own developments. Verum Option is licensed and regulated by FMRRC, that serves as a guarantee of security of the broker. The trading platform Verum Option mainly stands out for its performance. In other words, the trader can rely on high speed execution of transactions. In addition, it offers a large amount of trading assets 200+, 7 types of options with a different expiration dates and high percentage yield. It also provides the opportunity to double down on the time of open position and extend the option exercise period. The broker encourages with its rapid funds withdrawal without “unnecessary questions”. Customers of this broker can be traded using a mobile app for iOS and Android. Iran, Syria, Japan, North Korea, United Kingdom, United States and the Canadian provinces of British Columbia, Quebec and Saskatchewan. 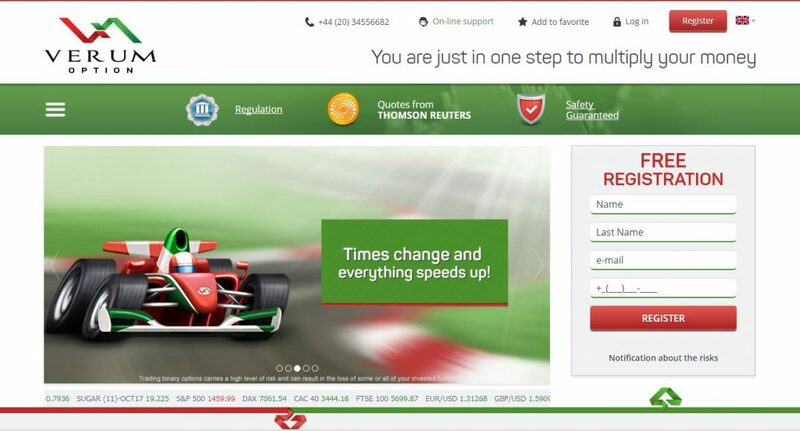 To register and open a trading account you have simply to go on the web site verumoption.com click on the button “Register”, then fill in the required fields of the registration form. After screen will display a window with a password, which is also repeated in the letter sent to the previously specified user email address. Then you will be redirected to your account using which you will be able to trade binary options, withdraw funds and to look through the history of you previous deals. Everyone are offered to open Demo account at Verum Option. This is possible by contacting the customer support of the broker. This “study account” supports exactly the same trading conditions as real. Although, given the small amount of starting deposit equal to $5 and the minimum investment – $1, you can safely test the platform and practice with real money. In addition to Demo and usuall accounts Verum Option developed the VIP Group. The trader will get 2% more profit with options to all the underlying assets, becoming a member of this group. The broker also provides a personal account manager. The manager helps and consults a trader at any time of the day. Members of this group can rely on maximum investment from classic options in the amount of $3000 when the usual – $1500. As a bonus Verum Option will provide every trader with a gift in honor of his birth day, without the risk of the transaction in the amount of $10. But please note that in order to apply and become a member of VIP Group, trading account must contain the sum of at least $1000. Verum Option offers a large selection of assets to trade on binary options, which are divided into 4 main categories: currency pairs, securities, stock indices and commodities. Currency pairs: 30 pairs (USD/JPY, AUD/USD, USD/TRY, USD/CAD, EUR/JPY, AUD/USD, BitCoin/USD, BitCoin/SPA, etc. ); Cryptocurrencies: Bitcoin, Etherium, Litecoin, Dash. Securities: shares of 114 companies (NINTENDO, GAZPROM, APPLE, GOOGLE, COCA COLA, etc. ); the Futures of 17 pieces (the NASDAQ FUTURE, BOVESPA-F, DOLLAR INDEX F., BITCOIN FUTURE, etc. ); Government securities (U.S 10 YEAR NOTE, U.S 30 YEAR NOTE, GERMANY 10YR BOND, GERMANY 10YR BOND). Stock indices: 41 (TADAWUL, DUBAI, NASDAQ, DOW, DAX, DOLLAR INDEX-DEC16, etc.). Raw market materials: 14 commodities (GOLD, SILVER, PLATINUM, SUGAR (11), WHEAT, OIL, CORN, PALLADIUM, etc.). It is worth noting that Verum Option offers traders a really good trading conditions. For example, the minimum deposit is just $5 with its minimum further replenishment equal to $5 dollars. At a time when the minimum investment in trading instruments is $1. This “threshold” we find a really low and affordable for beginners. At the same time, it allows experienced traders to use trading strategies that have a high level of risk. Also, for all those whose trading tactic is based on fundamental analysis, broker has developed section with an informative economic calendar. Verum Option also offers a “win back bonus” for each replenishment of the trading account. And in order to use this bonus, the trader need to use the promo code which he can obtain by contacting customer support. After receiving this code, it must be entered during replenishment on the broker web site of in a specific field. For replenishing a trading account you can use such payment methods as: VISA, MasterCard, WebMoney, Robokassa, Yandex money, Qiwi wallet, RBK Money, Bank transfer, in addition, it is possible to recharge account via mobile phone. 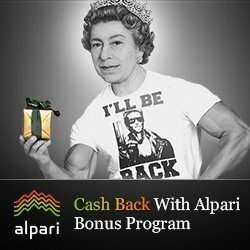 The minimum deposit is equal to $5. But it should be remembered that the funds are credited to trading account with a fees in the amount of 3.5-5%, according to the chosen method of replenishment. In addition, the funding is available only in USD. Regarding to withdrawal, the procedure will certainly be accompanied by the clarification of the desire of conducting this operation and the amount of withdrawal, by the managers from customer support. Cash replenishment requires commission payment, but less than during withdrawal. It to lasts from 1 to 5 working days, and the processing time is from 1 to 3 days. But in reality the withdraw of funds is much faster than the specified time. — If the minimum investment amount is 10$, then you won’t can trade as the experiment with fail, without lossing initial deposit – $5. — The withdrawal amount will be debited in USD, when you use any available withdrawal method, except the Bank card. At a time, when replenishment occurs in RUB. To familiarize with the Verum Option trading platform. You simply need to choose the tab “Trading platform”, which is placed in user’s personal account. This platform interface is intuitive and easy in use, which optimally suits for beginners. The platform offers 7 types of option contracts, that offers trader to enter into deals with a duration from 30 seconds and up to 1 year. In other words, the trader chooses from popular trading instruments — Binary / Long / Term / 60 Seconds, and to rather rare — Pairs / One Touch / Ladder / J Ladder. Also the platform has the additional option – CFDs. The last one are characterized by non-fixed profit, with proper use of leverage. It gives the opportunity to earn good money on high price fluctuations of the basic asset. BINARY is a basic contract that is profitable with the right traders forecasts about the quotations movement of the basic asset over a certain period of time. 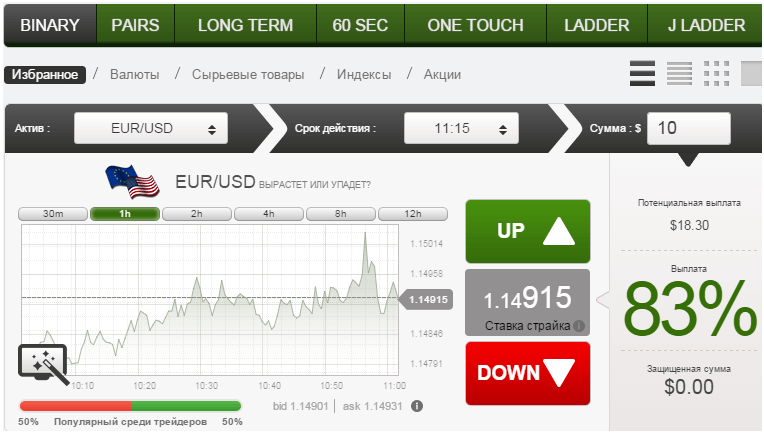 PAIRS is a type of binary options, which includes an asset consisting of two instruments. ONE TOUCH – option which is characterized by a yield above 400%. For profit, it must pappen the touch of asset price and the specified strike level. LADDER – implies that the trader sets a five strike levels to which the price of basic asset may relate during the period of the transaction. J LADDER – trader sets the profit percentage, as a result, indicates the distance between the start level of the transaction and the strike price. CFDs are contracts for difference, where the expected income depends on fluctuations value of the asset at the market. A special feature of this platform are also tools for easy and profitable trade. For example, using Limits, the trader can open pending orders at a predetermined price level. In turn, the Strategy Advisor will help to predict the price trend using three technical indicators without the need of working with indicators the trader’s hand. Verum Option trading platform also contains “Profit Follow copying service”. So, everyone can use the knowledge and experience of best traders for personal gains. It is possible by copying their actions and get a profit. The trader opens rating of a top traders depending on the asset, and chooses whose signals he wants to copy. After he sets settings for copying, such as: 1) the copying period of the selected top trader; 2) the amount of the investment on each individual deal; 3) the investment limit — the maximum amount of investment in each transaction are copied from the selected top trader. Verum Option web site contains all the necessary information of the trading binary options principles, basic trading strategies, the characteristics of option contracts types and step by step instructions for completing transactions. We have also devoted a compilation of training videos about binary options trading tactics, the nuances of analyses of macro-economic news, as well as the patterns of quotations movement of the basic assets. Additionally, trader can find interview with top traders there. Also, he can contact with the cusstomr service online or by ordering a free call and get qualificated advice. Operational customer support of Verum Option provides each customer with a personal manager. The manager provides comprehensive support and consultation. Also everyone can use online support directly by entering your contact information in the pop-up box operator on the web site. In addition, it is possible to contact via phone and/or send the message by filling the feedback form. Verum Option managed to give the Internet and its users a variety of advanced services. The trading conditions of the broker are equally loyal as for beginners, as for experienced traders. Therefore, the combination of a high technological level of the trading platform with modern safety technology (i.e. security certificates: EV SSL, STP NDD, PCI Security Standards Council). It makes a broker the best choice for all those who particularly appreciate the reliability and transparency of work, and those aimed at long-term and mutually beneficial partnerships. I think that the Expertoption broker is really good. In fact, working with him is very convenient. Without special difficulties you can deal with the platform, and there is already a matter of skill.